Our summer has finally come to an end. It's been long and eventful. Filled with lots of travel, family visits, celebrations. And work too amongst all the play. We celebrated Ramadhan, then Eid. A few birthdays were dotted along the way- it seems like July is a popular month for birthdays, no? We ate a lot of this. We visited the beautiful city of Cape Town. One of the most amazing holidays I've had. If you follow me on Instagram, you might have noticed the different shades of blue, turquoise, emerald and green I saw in Cape Town. That's when I realised how much I missed raw nature, the countryside, seafood, the mountains and rain. Yes, rain. And fog. And that light! Cape town has amazing light. And beautiful sunsets. And the best part of the summer holidays- long and leisurely breakfasts. We had eggs every way possible- baked, fried. But not poached. That's just not up my alley. Or Maryam's. Or Hassan's for that matter. In fact, eggs are not up his alley at all. Yet. I'm hoping that will change though. But what we all did agree on and always have is, pancakes. They're usually the Saturday pancake kind. Standard batter but different toppings. Maple syrup for me, honey for the kids, Nutella for everyone. Oh, and additional sprinkles for the kids. Sometimes, we add fruit and nuts too. These are a slight variation though, semolina pancakes. I first had these in Morocco- everyday for breakfast at El Fenn. I was smitten, still am actually. Even the name, baghrir, meaning one thousand holes that appear on the surface whilst cooking, is beautiful. Agree? They smothered theirs in honey butter at El Fenn. I decided to fill mine with honey sweetened mascarpone instead. We were celebrating Eid actually so its seemed only appropriate. They went down well, really well actually. Although the kids would have preferred to have their topped with sprinkles. 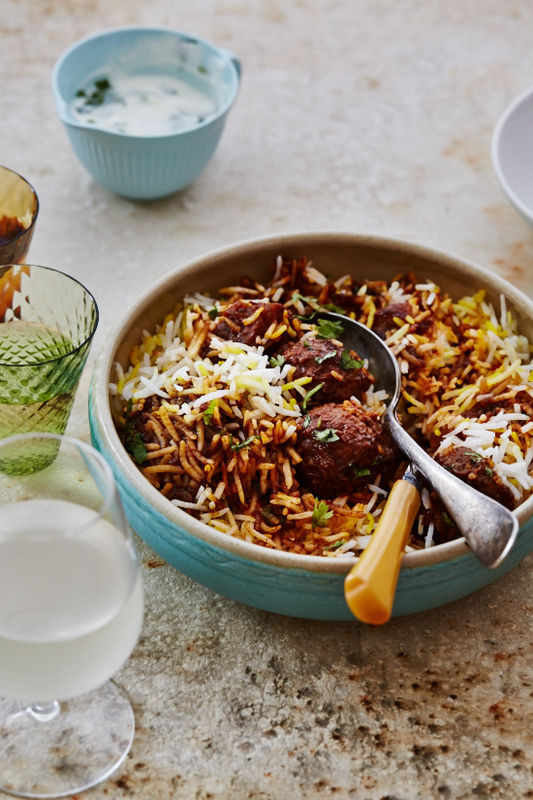 Our Eid celebrations were topped off with my mom's smoked kofta biryani and gulab jamuns. 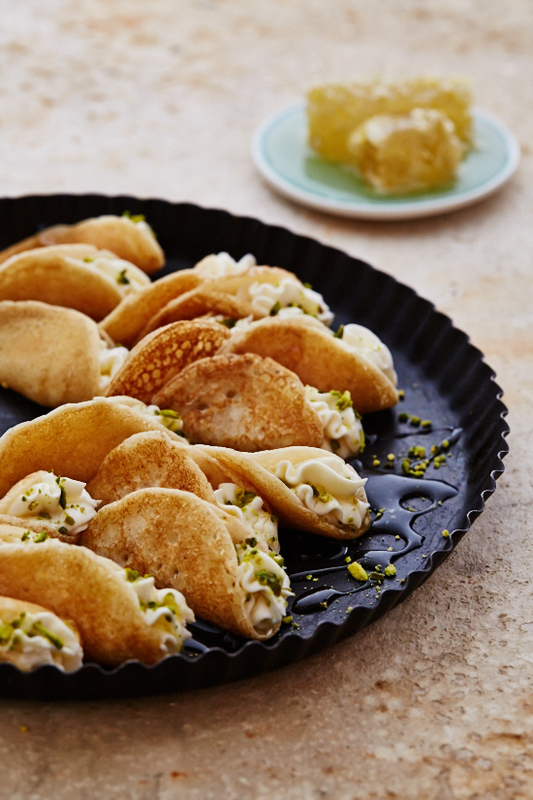 You can find the recipe on the Tesco blog who commissioned these recipes. In a large bowl, combine the semolina, flour, yeast, baking powder and sugar. Put the milk in a blender and add the dry ingredients. Whizz until the pancake mixture is combined and no lumps remain. Transfer to a bowl and cover with a tea towel. Leave in a warm, dry place for 45 minutes, until slightly risen and bubbles have formed on the surface. Meanwhile, whisk the mascarpone with the honey and set aside. When you are ready to cook, whisk the pancake mixture – it should be the consistency of double cream. If it is too thick, add a little water. Put a large nonstick pan over medium heat and grease with butter. Ladle some batter into the pan, tilting and swirling it around for an even layer. Cook for 1-2 minutes until the bottom is set and many bubbles have formed on top. Using a fish slice, remove the pancake from the pan and set aside on a plate. Repeat with the remaining batter. Dollop a spoonful of the honey and mascarpone mixture over each pancake, then fold it over to make a half moon; pinching the edges to seal. 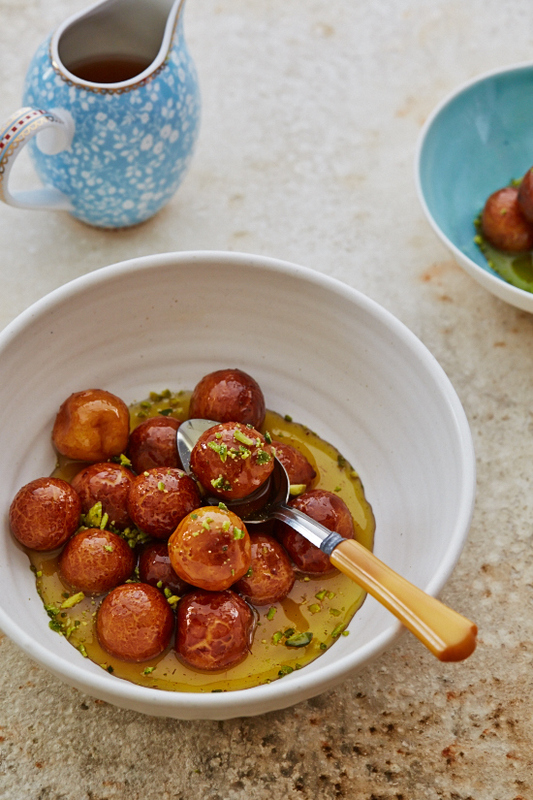 To serve, drizzle with a little more honey and scatter over the pistachios. Fabulous! This is a delightful treat. these surely looks like a great breakfast to indulge in. Cape Town! The mother city and my beautiful home! I hope you had an amazing time. And yes, the sunsets are amazing! I was wondering if you could tell me about how big each pancake it? Hi I used a mini pancake pan so my pancakes were about 12 cm or so, perfect as canapé style eating. You can make them any size really- as long as you swirl the batter so it spreads evenly and isn't too thick, you're good! Hope that helps! Can you tell me if these pancakes are like the ones in Canada (fluffy and cake) or are they more like a crepe? CharlesR- I'd say they are an in between. Because you want the holes to appear and don't cook both sides, they're not thick and fluffy. But being yeasted, they're not as light and thin as a crepe! I'm so glad they aren't like the pancakes here. Definitely not a fan of our pancakes. I find them too dry. I love crepes and I am going to try these. Will let you know when I do. Oh my goodness... I just followed your Instagram feed... it is gorgeous!! And your pancakes look amazing as well... Thank you... Enjoy your day! These dishes are absolutely gorgeous. I would love to try these. It is looks so good and Delicious!! And your dish look amazing as well... Thank you... Enjoy your day! These look delicious! I can't wait to try them!!! My mouth started watering the second I saw the first photo. Wow! I love how you describe the colours of Cape Town. I think it prepared my senses for the amazing food that followed. This recipe looks incredible, and I'm looking forward to trying them myself! These look like a delicious treat. I'll definitely try making these. Amazing!! this looks absolutely delicious!! I loved your blog post.Much thanks again. Really Cool. Thanks so much for the post.Really thank you! Much obliged. I really enjoy the article post.Really looking forward to read more. Great. Really enjoyed this article post. Keep writing. I am so grateful for your blog article.Really looking forward to read more. Really Great. Really appreciate you sharing this blog post. Want more. Very Good. Tourism not only helps to improve health, but also helps adjust the mental state. The more that people who love travel, the more we should focus on the significance of tourism.! Thank You. You can share new year wishes & messages with your friends. Let nike kobe 10 call her name in the back, but also a moment not to stay. Yuanjialuzhai, Kobe 10 Shoes did not expect to escape the return encounter in the elevator FUJIAN SCHOOL. Elevator doors opened, two outside the door of a fight face to face, all is robust. FUJIAN SCHOOL react first, out of the elevator, immediately looked up and down Nike Kobe 10: "? How willing to come back?" Yan Liang wrinkled brow: "You seem not qualified to speak with this tone with Kobe 11." "Lebron 14 was in for dad to ask you. You do not go home New Year last year, is now home to a mess you non-stop to come back, Lebron 13 Shoes is hard not to think of you this is going to have a share in disarray." Lebron 14 Shoes bypassed her left, was stopped: "how left?" "If you do not want to fan Lebron 14 Shoes like I did last time, now give me out of the way." Lebron 13 Shoes smiled: "You do not say I have forgotten, I'd really want to thank you for that slap, not the case, how can Nike Hyperdunk 2015 cry to the father to so many shares?" Hyperdunk 2015 has been to restrain clenched teeth. "You do not know, then how angry your mother when Nike Kobe 10 is willing to let my mom at the door, because an agreement: I can not fight you can share with How about Kobe 10 Shoes, slap your mother ruined so many years of hard work , if I do, she can not be mad at non. " which one is not to be pointing? out of money to make up for it, 2015 Hyperdunks absolutely agree. Another example is weeks away, you Why that he hello, not pity you? " Hyperdunks 2015 eyes that make cluster anger Yan Liang very welcome. Trang tri noi that trường hợp chủ hộ là một người ưng ý diện tích nhiều màu sơn, chủ nhà có thể biến đổi noi that nha bep diện tích ngôi nhà bằng những ý tưởng sáng chế trong bài viết này. sử dụng giấy dán tường làm đẹp giúp giảm mức giá đồng thời có thể thay đổi nhanh không đề nghị nhiều kỹ thuật, thời gian giống cách sơn tường cổ kính.Nhìn vào những hình ảnh liên quan đến việc phân bố bình thường dùng hoa văn nhẹ đơn thuần. Có các bức tường được bố trí Tham khảo thêm dịch vụ thiet ke noi that - thiet ke nha hang - thiet ke noi that can ho - thiet ke noi that chung cu- thiet ke noi that van phong - nha dep 2016 - thiet ke noi that shop - thiet ke noi that showroom - thiet ke noi that phong ngu - thiet ke noi that phong khach đồ trang trí trong nhà mê say với giấy dán tường hoa văn bằng cách tiêu dùng bảng màu xám thanh lịch thường thấy trong nơi nghỉ dưỡng, trường học theo cá tính phương tây. Đó chính là bảng màu trung lập và mềm mại. kế tiếp sau quy trình tô điểm noi that phong khach , nền của những phòng ngủ được làm đẹp với hoa văn nhưng vẫn tối giản hoa văn dư thừa cho chỗ ngủ nghỉ thêm phần thỏa mãn. Một số trường phái khách thường được nhiều kiến trúc sư đồ đạc chỗ ngủ nghỉ tận dụng là sự liên kết lặp lại làm nổi trội nét đẹp chính của hầu hết gian phòng gồm cả noi that van phong còn được gọi cách khách là bố trí hình học của do go phong ngu . Very good post. I certainly love this website. Keep writing! I wanted to thank you for this excellent read!! I definitely loved every little bit of it.Cheers for the info!!!! & This is the perfect blog for anyone who wants to know about this topic. I like Score Hero, camera b612, papas games, Piano Tiles 2. Papas Games is really something, none of the series are cliché and all of them are very much enjoyable. I really liked your blog post.Really thank you! Cool. Great, thanks for sharing this article post.Really thank you! Thanks for the great post. Pretty good post. I just stumbled upon your blog and wanted to say that I have really enjoyed reading your blog posts. agario game - agario is a massively multiplayer action game developed by Matheus Valadares. agar a multiplayer browser game in which players have to eat competitors or be eaten while striving to dominate the world of colorful cells. agario game can be played in a deathmatch or between teams. To control the game agar io you just need to use your mouse/track pad, the "w" key and the SPACEBAR. The mouse navigates your blob around and the SPACEBAR allows you to split your cell(s) in half and the "w" key allows you to eject mass for feeding other players, viruses or help you drop some weight to get out of a tough spot. Enjoy the world of agario! Have you ever met someone who liked the similar readings that you read? Its amazing to read inspirational quotes or love quotes for her to get better in life. It's perfect for those students, who want to study about this faculty. I like the news that you have written in a detail. I like play games ninja games online, free games, Douchebag Workout 2, papa games. How about you? First You got a great blog.I will be interested in more similar topics. Thank You. You can send mother's day quotes to your mother.